1. Do you prefer to write with pen or pencil? – Typically pen. When I was teaching I used a lot of different ink colors for correcting. I was also a stickler for using pencils when doing math and lesson planning. 2. What was off limits to you growing up that you do all the time now? – The only thing I can think of is talking on the phone late or going on the computer when I wanted to. Our computer was on the other side of my brother’s room (had to walk through it) and it caused some issues. 3. What is the age difference between you and your spouse? – Hubby is about 8 months older than me. 4. Did you hurt yourself in anyway this week? – Yes, my finger has a giant gash in it from when I put it in my son’s mouth during his first febrile seizure of the weekend. 5. Do you like wallpaper enough to hang it in your home? – No, we took it all down in the house except for the bathroom upstairs. That will happen one day down the road. 6. What do you need to do that you’ve been putting off? – Need to take kindergarten kid back to the doctor for his second Hep A shot. We went a few weeks ago and they were out of it and never called (we had an appointment). Little does my son know, it will happen today after his dentist appointment. 7. What did you do this week that you wish you hadn’t? – I wish I never had to watch my son have a febrile seizure two times. The first was the worst when we did not realize what was going on and thought he was choking as he turned blue. Also wish I did not have to go by ambulance to the ER. Had I thought about it I would have picked another hospital because of how pathetic the care was once again at the so called "better" pediatric location. 8. Did anything keep you up late this week? – Prior to last night, I probably could have counted all of the hours I slept this week on my two hands and maybe one foot. Nothing like waking every two hours to fight a fever to try to avoid a third febrile seizure for the week in your little one. Hmmm. 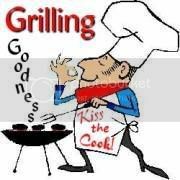 . . not sure what Grilling Goodness is? But love reading your questions and answers? Have a happy weekend!! Ollie McKay’s’s last blog post..Wish you were on an Island?. . . Me too!